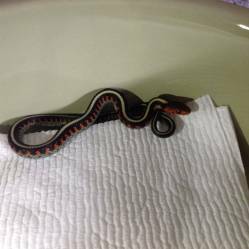 Description: 3 month old well started Oregon Red Spotted garter babies. Feeding well on f/t pink mice cut in half or X small day olds, fish both fresh and f/t cut to appropriate size, live cut nightcrawlers. Gorgeous coloration and patterning with calm dispositions. Asking 325.00 shipped for pairs. Limited supply available now. They will be ready for new homes on Dec. 7, 2017. Thanks for the consideration.